In the bigger canoes, the space was big enough under here [the front deck] so that if a child was with a parent and it was naptime, then they could put them under the bow and they could sleep in there. Big traveling canoes made of birch bark were twenty feet (6.1m) or even thirty feet (9.1m) long, whereas hunting boats were much smaller. All were light, fast, and delicately balanced. Canoe makers first stitched the bark hull together inside a boat-shaped outline of stakes driven into the ground. The birch or willow frame of the boat was then constructed inside. Bark pieces were sewn together with split spruce roots and seam-sealed with hot spruce pitch. Canvas-covered “ratting canoes” for hunting muskrats became popular in the early twentieth century. Eliza Jones: Kk’eeyh beedoye [birchbark canoe]. Trimble Gilbert: K’ii, k’ii tr’ih [birchbark, birchbark canoe]. Aron Crowell: That’s the canoe itself? Trimble Gilbert: Yes, that means it’s this part. And this is k’ii tr’ihtaa’aii [birchbark canoe paddle]. Eliza Jones: Tughu‘oye [paddle]. How bout you? 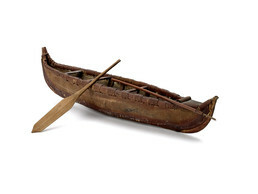 Phillip Arrow: Vaxa ghidiqal [paddle]. . . .
Judy Woods: My husband use to make canoes. Eliza Jones: Did you paddle around in them too? Judy Woods: Yes . . .
Trimble Gilbert: Yes. They use it for bear too. . . .
Aron Crowell: Would you ever use the spear from a canoe on caribou? Trimble Gilbert: Yes, that’s what they do. When they are swimming, like moose or caribou are crossing that river, they use any kind of weapon like this. Use a kind of bone knife or this kind. Aron Crowell: How about the canoe itself, does it really look Gwich’in style? Trimble Gilbert: Yukon River, I seen this kind, a lot of them. Long time ago, that’s all they used. .
Eliza Jones: What about where you’re from? Trimble Gilbert: Where I’m from, it’s not—this point [at stern] is missing. . . . And they use caribou skin or moose skin [boat siding]. Maybe two or three moose skin, sometimes four. And caribou skin too, maybe six, seven, eight. They sew it together. And they make a big canoe like this. Downriver they haul a lot of stuff in it. And when they sew it together, that skin, then they use that large grease, some kind of fat, put it on the sewing, so it don’t leak. And birch bark, they use that like pitch, right? Phillip Arrow: I’m familiar with this because my mom made lots of this kind of model, and I think when I was really small I see this kind made out of birch. Now they make use wood. We use it lots, hunting muskrats and all that. Same model right there. Eliza Jones: With the points up on there [bow and stern]? Phillip Arrow: Right. . . . And this cross-piece, same way too. That’s where you sit. Eliza Jones: So what do you call that in your language? Phillip Arrow: Tr’eyh [canoe], tr’eyh. Trimble Gilbert: Well, in our area we make it different . . . And we use that willow or spruce tree. We bend it like this [triangular shape], flat bottom. That’s what we use in our area. Van kì‘ [end piece]. My language is van kì‘ [end piece]. That’s for the end. Jìi chan vakhoh rii giiyàhnyaa [they just call this the frame]. Vakhoh [frame]. Aron Crowell: So the frame is made out of bent willow? Trimble Gilbert: Willow or either young spruce tree. Aron Crowell: And what about the keel? Trimble Gilbert: We look for a dry stump and then we use it. . . . Jìi chan taa’aii, aii jìi chan [this is also a paddle that] we make it out of dry spruce. . . . Dry one is light one, so we use dry wood all the time, spruce. Eliza Jones: Would they use a rawhide to tie it [frame] on? Trimble Gilbert: We use the rawhide from caribou skin. . . .
Eliza Jones: One year we recorded my husband’s grandmother. And she said, when she was a child, her mother was a widow, and she said she had older brothers. They were in camp and it was in the spring, and she told her sons that they were going to make a canoe. So she said she followed her mom around. She took the boys out into the woods. She said they walked around about half a day until she found just the right kind of birch. And that was when she described the back, the front and then the horizontal lines at the eyes. And so she said she cut down the tree, and then she said they cut it down its belly. She used human anatomy to describe it. Cut down the belly, and then they peeled it [bark] off real slow. And when they got enough for the canoe, they rolled it up and kept it in a cool place. And then she said her and her mom spent a day walking around in the woods picking sap, spruce sap. Judy Woods: For the frames, for this end, they’re back to back, and then they bent the ribs to shape the keel. Eliza Jones: Yes, and it would be like this [upside down]. When the boys got the frame done, then they put the bark over it. And then she said her mom did the sewing. And where you need to patch, they overlap it. And they have the birch sap mixed with feathers and something else, and then they heat up this sap so that it’s liquid, and then they use that as a glue. And then her mom sewed it. And then I think they also sewed a piece of bark here [stern] at both ends. And the ones—I don’t know about this, but I know I heard stories that people who made canoes a long time ago spent a lot of time finding just the right big spruce root to shape into these k’enaat [keel]. Aron Crowell: How would people use the canoes? What time of year, and for traveling or hunting? Judy Woods: That’s all we had. Eliza Jones: Yes. Almost every able adult who could paddle, they made a canoe for them so that they could have muskrat and go hunting ducks and stuff in the spring. And if their canoe is big and there was a child, the mother would sit in the middle and have the child sitting in the back, facing not in the same direction as the mother, but facing the opposite direction. And the child would have to learn to stay still, you know, because canoes can be tippy. Judy Woods: Some of them were tippy too. Eliza Jones: There’s certain way that you step into the canoe, and when you get up, you carefully step out again. Trimble Gilbert: You know muskrat is the way people make money a long time ago. So every spring, almost every family, they make their own canoe. Eliza Jones: Canoes and paddles. . .
Suzi Jones: Were the canoes made different sizes for different people? Or were they all about the same size? Trimble Gilbert: Oh, yes, family size. Some people can’t afford to buy a whole material, you know? Single people they don’t need big one. A family’s got to carry a lot of stuff. They even go up stream too. Eliza Jones: My Auntie Bessie said when she was a child, she remembered traveling for two weeks up the Koyukuk River. And she said the canoe that they had was made of birchbark, and she said it was big enough that she remembers standing up in it. Eliza Jones: They get in trouble. It’ll leak. Trimble Gilbert: Anything it belongs to – tools – belong to us. It’s not to play around with. And this is the way we’ve been trained. We have to be careful to use this, like the way we handle this. But today, our kids are different, just waste a lot of the material for nothing. Eliza Jones: Also, there was a lot of respect. Eliza Jones: We were taught, when we were very young, not to step over men’s things and not even handle men’s tools, us children, especially if you were a girl . . . because there was so much respect for the hunting. Trimble Gilbert: . . . Before my time—it was a long time ago, we have a rule like that. Before 1930, we lost just about everything, just like we put everything together in a pot and we stir it up. And we lost a lot of traditional values. Before that they were really strict with us. We have to follow the rule. Eliza Jones: I think the church had a lot to do with that. Eliza Jones: Because the church thought that was evil or something. And it’s not. Trimble Gilbert: It’s not. So I thought about it too for many years, but now since last year, I know that’s very important to us—it belongs to us! It’s a gift and we can’t leave it behind. That’s why we got problems today. We got to go back and teach about all these things and where we come from. Eliza Jones: How you respect everything. Trimble Gilbert: How you respect everything. Eliza Jones: Food. And I know in camps, where you work on fish and stuff, you always clean up. And where you work on game, you always clean up . . . and dispose of it properly. Trimble Gilbert: Nothing is wasted in what we do. Trimble Gilbert: Respect in whatever you get out there, and you have to bring everything back and respect the animal. Nowadays, this is the way we train too, respect for animals.